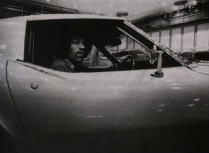 Jimi knows a million different ways to play. Picking a "slow blues" so fast he surprises even himself. Hows that for genius? What do you get when you combine Billy Cox, a Nashville R & B bass player, and a fusion power-drummer, "The" Buddy Miles, with a virtuoso lead guitarist? A new freakin' music genre, that's what! 2 nights only! didn't stop Jimi from getting on stage for his fans. cavities, empty kneecaps and elbows." "...for those that may be listening." "Watch out for North Dakota!"